I made you a salty cookie. I made you a cookie with sugar and sea salt inside. And butter: lots and lots of butter. I made you a cookie with egg wash and black and white sesame seeds on top. I made you a cookie you can eat with coffee or a cocktail, with olives or ice cream. I made you a very confusing cookie. But a delicious cookie, too. These cookies have been lurking around my Pinterest board for months now, just waiting — nay, begging — to be made. So fine, I said, I’ll finally make you and your weird, hard-to-tell-if-you-are-tasty self. So I did. And they were good. So good. So, so good. So, so, so good. I think you catch my drift. I would show you how I made the dough for these cookies, divided it into discs, rolled out the discs and froze them, but it was all sorts of boring to look at so I figured I’d better not bother you with it. So we’ll start here, which is closer to the good stuff. And by good stuff, I mean the eating. Natch. 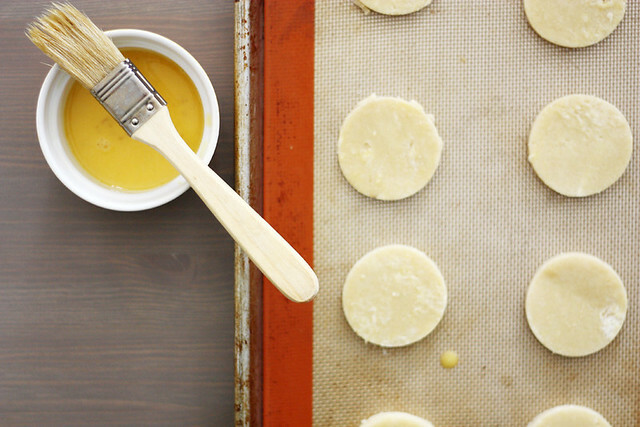 The recipe calls for using a 1 1/2-inch round cookie cutter, which I would recommend. Otherwise, you end up like me, with a 2-inch round cookie cutter and only about 15 cookies per batch. This is OK if you want these cookies in and out of your life as quickly as possible — not OK when you want the cookies to stick around a while longer. You know, maybe past dinner. You’re going to brush some egg wash on these cookies. I know, it’s the weirdest. Just go with it. 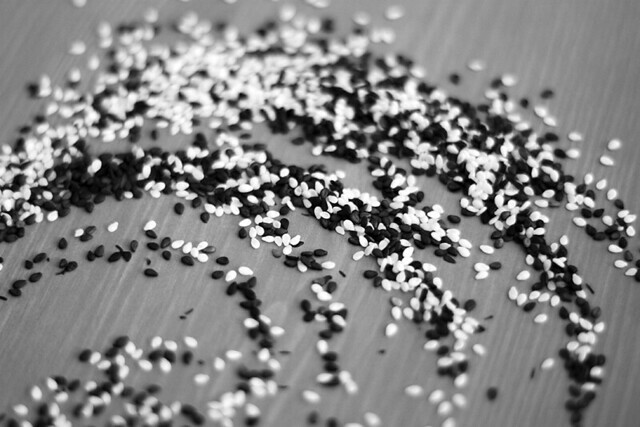 Black and white sesame seeds, you is pretty. Finally, my favorite part: The eating. As if I really needed to make that clear. I made you sweet and salty cookies, and they are so, so, so, so g– anyway, I think you’ll like them. In the bowl of a food processor, add flours, sugar and salt; pulse until combined. Add butter and pulse until coarse crumbs form. Slowly trickle water into spout while pulsing food processor, adding just enough water til a dough just begins to form. Remove dough from processor and knead a few times on counter top. Divide dough into two discs. Roll each disc between 2 pieces of wax paper into a 1/4-inch disc; place discs, still covered by wax paper, on a baking sheet. Freeze dough until firm, about 1 hour. Heat oven to 350 degrees F. Line two baking sheets with parchment paper or silicone mats. 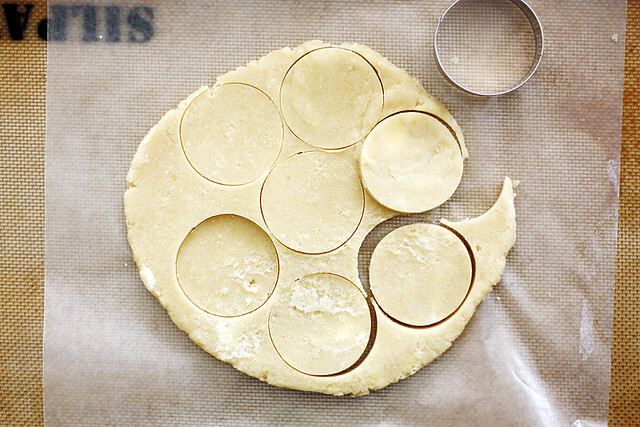 Using a 1 1/2-inch round cookie cutter (or whatever size you have, though obviously the larger the cookie cutter, the fewer cookies), cut dough into small round discs. Place discs about 1 inch apart on prepared baking sheets. Brush tops with egg wash, then sprinkle liberally with sesame seeds. Bake cookies until lightly browned, about 15-20 minutes, rotating halfway through. Let cool on baking sheet 3 minutes, then transfer to a cooling rack to cool completely. Holy Cookie these look soo good. I love salty and sweet desserts. Can’t wait to try these! These are just like the ones in the Asian bakery and the ones you get on the Dim sum chart here in Australia. Asians love anything salty, even in sweet stuff. 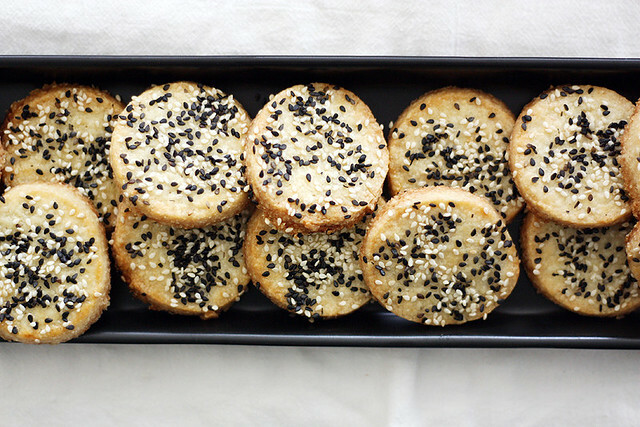 I have a sesame seed addiction, it is in everything and can not wait to recreate this at home. Belinda — No kidding! I think the sweet/salty thing in cookies is my new obsession. 🙂 Thanks for the comment! Stephanie – these look amazing! I’m obsessed with sweet & salty too! These look gorgeous in your pics!!! What charming little treats! The black and white sesame seeds are enchanting! Robyn — Ugh, sweet and salty = I can’t get enough. 🙂 Thanks so much, dear! these look ridiculously amazing. I love sesame seeds in desserty things, oddly enough. I’m so intrigued and beguiled and bewildered and oh man I need to try these and devour them all! Fine, I’ll share with someone else. If I have too. Kelly — Me. Too. We should start a club. 😉 Thank you! Caroline — I think I need to go to China because this is my new favorite kind of cookie! 🙂 Thanks for the comment! I loooooove salty/sweet. And almond flour? Sesame seeds? Sign me up. These look so good! We have similar cookies here in Turkey, but in a ring shape and just salty. I love the combination of sweet and salty! Mom brought me lots of white, brown and black sesame seeds and I was thinking what to make with all those seeds. I know it now, thanks! Ah! I am SO happy to see these!! My mom is Japanese and made cookies very similar to this when I was growing up! Her birthday is coming up in a couple weeks… I am definitely going to make these for her!!! 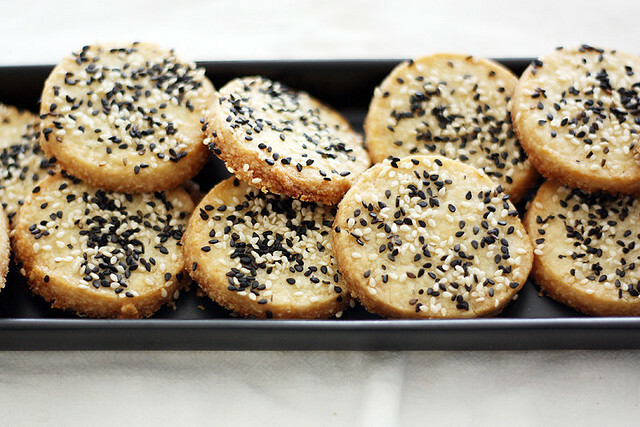 So intrigued by these cookies, love the sweet/salty combo and the sesame! These look phenomenal!! Sweet and salty is my favorite – these obviously fit the bill. Pinned! What a fun twist on a traditional cookie recipe! these cookies look SO good. I love that you used almond flour and sesame seeds. this is like the best combination, ever. 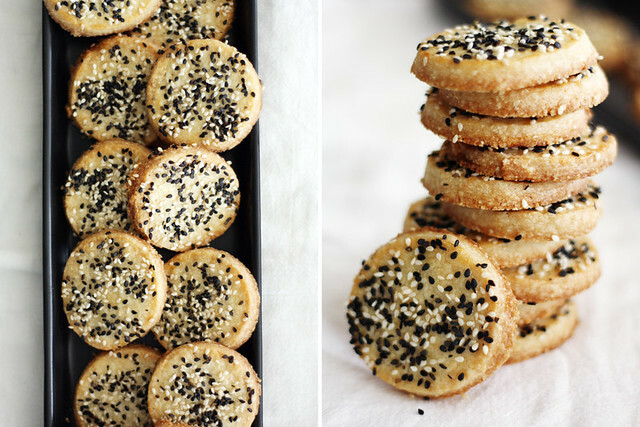 they’re used so much in asian cookie treats – i want to make these asap! Very interesting flavor combination–I would never have thought to put them together. I like sesame, I might need to try this soon! I have never used almond flour but am wondering if you could use all almond flour which would then be great for Passover! Abbe — You can definitely try it, but I’m not sure the dough will hold together as well as it does using all-purpose flour. Let me know if you do try, though! Salty cooooooooookie! I like a confusing treat…a nice unique cookie with savory sweet components is welcome by me! And sesame seeds are a must try! SHUT THE OVEN DOOR!! I’ll take a dozen please! What a fun idea for a cookie! Alice — Thank you so much! These are so pretty and sound delicious! Sesame seeds are the cutest. I adore sweet and salty – I need these!! I am so totally mesmerized by your photography skills! Those photos just pull me right in, and I can practically taste how buttery and flavorful these cookies must be. Thanks for sharing! Wow, these look wonderful and your pictures are breathtaking! So lovely! I love the sweet-salty combo of these cookies too. Thanks for the great recipe! Oh YUM! I love all things sweet and salty. Totally want to try these! Sounds like the cookie for me! Salty > sweet in my world. omg this looks amazing. THe first thought that hit my mind was THESE AND CHEESE and a good wine. heaven! Georgia — Aw, thank you so much! Fawn — Totally agreed. 🙂 Thanks for the comment! Miyafoodblog — YES. Cheese + wine + cookies = best meal ever. Confusing cookies are still COOKIES! And yours look like perfection, Stephanie! I’m in. Ashley — True story! 🙂 Thanks so much, dear! I have these pinterest-ed also and can’t believe I’ve exercised any willpower in making them either. 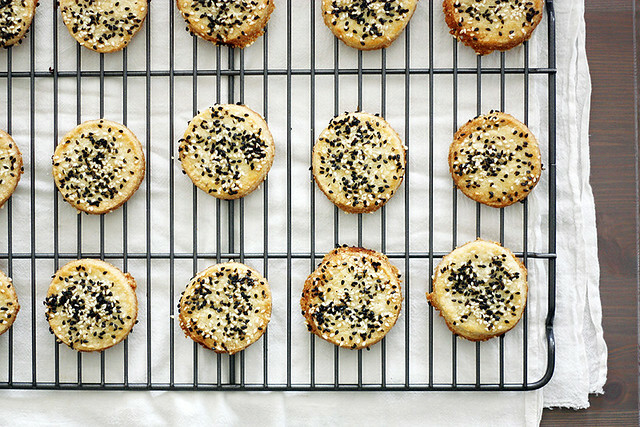 I love all things sweet, salty and sesame though…so these need to be in my life. WOW! This looks and sounds amazing. And looks pretty easy to make! Never thought of the sesame seeds on cookies. Stephanie! Okay… first, your photos are amazing!! LOVE LOVE LOVE them! and secondly… I’m a huge sesame fan… like it’s kind of weird, and I really can’t explain it, but I’m so glad you made these and now I think I’ll make them too! Because salty and sweet is my fave! These are beautiful! I love that you call them confusing cookies! They sound fantastic!! Mackenzie — Haha, it’s the best way to describe them! 🙂 Thank you, dear! I love the sweet and salty combination too. And those sesame seeds? So pretty! Baking Serendipity — Thank you so much!